Algirex (Etoricoxib) is a Non-Steroidal Anti-Inflammatory Drug (NSAID) that exhibits anti-inflammatory, analgesic and antipyretic activities. It is a potent, orally active, highly selective cyclooxygenase-2 (COX-2) inhibitor within and above the clinical dose range. 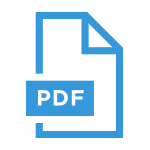 COX-2 has been shown to be primarily responsible for the synthesis of prostanoid mediators of pain, inflammation and fever. Selective inhibition of COX-2 by Etoricoxib decreases these clinical signs and symptoms with decreased GI toxicity and without effects on platelet function. Algirex 60 Tablet: Each film coated tablet contains Etoricoxib INN 60 mg. Algirex 90 Tablet: Each film coated tablet contains Etoricoxib INN 90 mg. Algirex 120 Tablet: Each film coated tablet contains Etoricoxib INN 120 mg. Pain and Inflammation in Osteoarthritis, Rheumatoid Arthritis, Acute Gout and Ankylosing Spondylitis. • Osteoarthritis, ADULT and CHILD over 16 years, 30 mg once daily, increased if necessary to 60 mg once daily. • Rheumatoid arthritis and ankylosing spondylitis, ADULT and CHILD over 16 years, 90 mg once daily. • Acute gout, ADULT and CHILD over 16 years, 120 mg once daily for max. 8 days. Dizziness, headache, gastro-intestinal disorders ( e.g. abdominal pain, flatulence, heart burn), palpitation, fatigue, influenza-like symptoms, ecchymosis; less commonly dry mouth, taste disturbance, mouth ulcer, appetite and weight change, atrial fibrillation, transient ischaemic attack, chest pain, flushing, cough, dyspnoea, epistaxis, anxiety, mental acuity impaired, paraesthesia, electrolyte disturbance, myalgia and arthralgia; very rarely confusion and hallucinations. Decreased kidney function and liver function, dehydration, hypertension, history of heart failure, perforation and people over 65 years of age. Warfarin, ACE Inhibitor, Rifampicin, Lithium, Birth control pills, Methotrexate, Digoxin. Patients with known hypersensitivity to Etoricoxib or to any of the excipients of this medicinal product, active peptic ulceration or gastro-intestinal bleeding, severe hepatic dysfunction, children under 16 years of age, inflammatory bowel disease, uncontrolled hypertension, breast feeding. Algirex 60 Tablet: Each box contains 3×10’s tablet in Alu-Alu blister strip. 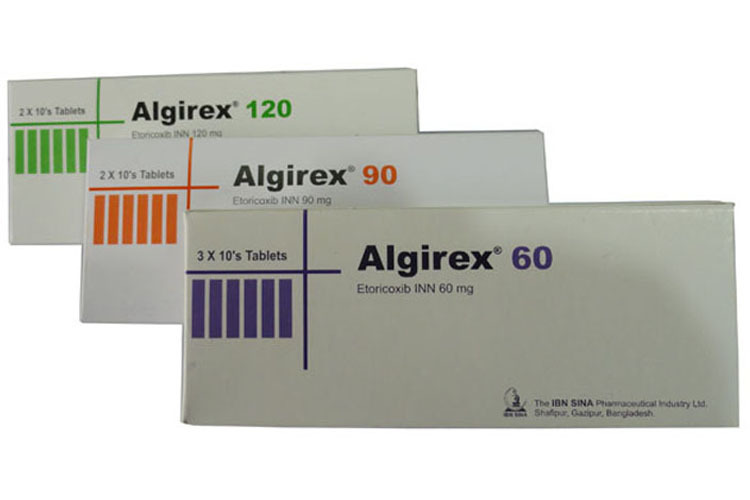 Algirex 90 Tablet: Each box contains 2×10’s tablet in Alu-Alu blister strip. Algirex 120 Tablet: Each box contains 2×10’s tablet in Alu-Alu blister strip.